Why we kill | Welcome, visitor! Killing butterflies and moths. To some insect lovers that very thought leaves a bitter taste in their mouth. Especially when people do it for the ‘fun’ of it, to complete their personal collections. The more rare or colourful the better it seems; is pinning insects for entertainment an outdated practice; a savage thing of the past? Believe it or not, but insect collections are extremely important to our understanding of Lepidoptera. Without the combined efforts of the dedicated collectors of the past, we would not have come close to the level of understanding that we have obtained of them in the present; and neither will our level of knowledge progress as much in the future, if we stop collecting. Collecting should be encouraged in this regard, for a lack of collecting means a lack of understanding. This page will elabore on the how and why behind it. I believe that while I am not a collector, collecting should be supported – entomology and collection go hand in hand! Killing butterflies and moths. Why is this necessary? There are many reasons why researchers, naturalists and biologists have collected insects since the times of Carl Linnaeus and Charles Darwin, and why such collections will always remain irreplaceable to science. 1). Identifying many species of butterflies and moths is in fact impossible by just looking at their appearance. In fact, the definition of a species can be a vague one if we’re talking about insects. What is a species? The truth is; nobody knows. Charles Darwin once said; “… I look at the term species as one arbitrarily given for the sake of convenience to a set of individuals closely resembling each other..”. Of course, a lion clearly isn’t a zebra. But if you look at insects, the boundary line between different species is not so well defined. In many cases, evolutionary lineages of butterflies and moths have very subtly diverged in many geographical areas – resulting in differences in appearance or lifestyle. Usually, if two populations have diverged so much that they are unable to produce (fertile) offspring, they are regarded as different species. For this reason, genitalia have been an important point in the past, for Lepidoptera have complicated genitalia that fit together almost like “puzzle pieces”; species with different shaped genitalia will fail this lock/key mechanism and will be unable to pair with eachother. In some cases they can pair, but produce infertile hybrids. When two lineages do not produce fertile offspring that reproduces in the wild, most of the time we call them different species. And if they still can reproduce but are still vastly different in ecology or appearance, we call them subspecies. Generally, if you ask a biologist ‘what is a species?‘ they will answer with “a group of living organisms consisting of similar individuals capable of exchanging genes or interbreeding”. That sounds like a broad definition, because it is! There is no clear definition of what is a species or not. Some species do not exchange genes or interbeed at all (microrganisms such as bacteria for example; and others that reproduce asexually). And some organisms appear to be the same species on the surface level but actually consists of multiple groups of individuals that reproduce in their own unqiue ways and are not compatible with eachother; such as asexually and sexually reproducing dandelions (Taxaracum) that have mutated to have diploid, triploid or tetraploid groups of individuals that are not compatible with eachother. But to us, the dandelions in our garden appear to be the same ‘thing’ while in reality, many of them are incompatible with eachother and have unique evolutionary lineages. The genitalia that have been mentioned earlier in this text cannot be studied in the field. To investigate their morphology and shape, dead Lepidoptera must be dissected and prepared under the microscope. While many species may look the same or identical by appearance, their biology and ecology can actually show huge differences. Especially in localities in there tropics, where there are dozens of species capable of participating in complex mimicry rings that make all of them similar by appearance, but different per species or even family. A lack of prepared specimens means a lack of understanding of their speciation. It is not possible to describe new species or subspecies without sufficient material. Conservation and protection measures would be impossible if we could not even differentiate between them as species! Besides that, these discoveries are more often than not random instead of ‘guided’ by a suspicion. Therefore, this makes a good case for collection as a form of surveying biodiversity as a whole. 2). The data: information such as geographical distribution, flight times, ecology, wingspans and other data that can be condensed into other important ecological key factors (such as the number of broods per year) written down and recorded in scientific collections. It is generally hard to impossible to sample all of this in the wild, while leaving the insects alive. While arguably things such as geographical distribution can be surveyed in the field, it is hardly a good replacement for collecting. Much information is lost when selectively surveying biodiversity based on investigating a few specific properties of the animals. When captured and preserved, the insects can be researched as a whole, including their DNA, morphology, genitalia and more. This can also be very helpful in regards to future research, of one wishes to research different aspects of the same species. Imagine that in the future, the species you research turns out to be two different species, or that you suspect that there is important gene flow between populations that keeps both of them alive. If you had collected the insects, there would be no need to re-investigate them again and again in the field. DNA is another extremely important aspect. As the worlds biodiversity is being threatened, many species can be expected to die out in the future. Not only do collected specimens fully represent possibly endangered or rare species, they also save as a database of DNA. DNA is used for various purposes; COI gene analysis is used to describe new species and taxonomical groups nowdays. But also when one wants to investigate the subtle differences or gene flow between populations to understand their geographical distrubition and relations, one needs to rely on a sufficient storage of DNA collected over their entire geographical range. 3) Taxonomy: One of the general rules of taxonomy is that if you discover something new, you must first review all the possibly similar looking species and prove it is not one of them. Can this be done with pictures instead? In rare exceptions this can be done with pictures: “Can a photograph or holograph be a type specimen? No, but the specimen depicted can be. Where a species name has been based on a photograph, illustration or description, the name-bearing type is considered to be the specimen(s) illustrated or described (Article 72.5.6; 73.1.4) the fact that the specimen is no longer extant does not mean that the species name is unavailable. While it is highly desirable to have a type specimen or part of a specimen permanently deposited in a museum or other publicly available collection, very occasionally it may be impractical, for example if it is unethical to kill or injure an individual of a highly endangered mammal. Other forms of evidence e.g. photographs, sonograms, may contribute to an original description in demonstrating that a type specimen existed, where the type specimen has to be released live. In these situations it is not necessary to deposit types in a Museum(. )” – International Commission on Zoological Nomenclature” While in very exceptional and controversial cases pictures have been used to describe new species, it remains a very impractical method, since a photograph can never capture all the important morphological aspects of an insect; as I mentioned earlier on this page, the difference between some species can be internal (genitalia) or can only be viewed under a microscope or after a dissection. Furthermore, to describe different populations, subspecies and species one must have a series of organisms to compare with eachother in order to see all the differences. Taxonomy without specimens would make for very low value sloppy reference material. Counter argument; killing Lepidoptera hurts them, so collecting is cruel. I’m sorry but.. nope. This is probably wrong, because evidence points toward the fact that insects do not experience pain. Insects probably do not experience pain. Discomfort becomes pain when it is an emotional experience. All organisms avoid harmful stimuli, even bacteria swim away from toxins. That does not mean they experience pain, it is called nociception. If you look at their ethology for example – if you badly wound a mammal you will see a chance in behaviour, while if you say remove the abdomen of a butterfly, it will behave the same. This is because an insect is the sum of its parts – even if you dehead a mantis or butterfly they can often still fly or pair because the entire body is controlled by decentralised ganglia – many of their movements even bypass the brain. Pain is an emotional experience and a state of being (suffering). Not only do insects lack the appropriate neurology or behaviour that points to them being able to feel pain, they also lack the brain parts responsible for suffering and emotion.I think that ascribing pain or emotions to insects is a form of anthropomorphism. Of what we currently know of pain tells us it is linked to emotion. Plus the fact that insect behaviour does not change after experiencing damage or discomfort, they may only exihibit fixed action patterns to avoid the harmful stimuli. So all current behavioural research points to them not exihibiting the ability to suffer. “Pain = an unpleasant sensory and emotional experience associated with actual or potential tissue damage or described in terms of such damage. Of course we can never experience what insects feel or experience, that’s not possible unless you are a butterfly. But the same way we can not observe the big bang or the evolutionary history of all creatures on earth, but we can look at the clues our environment gives us – such as physics or fossil records that count as evidence to support some of our theories. Why do I mention this? To illustrate that in the scientific world, there are many things we cannot directly observe or theoretically disprove – and that is fine, if we are using an evidence-based approach. In the case of pain vs nociception, the current evidence suggests they do not experience pain, so it is now regarded as the status quo unless new evidence emerges that states otherwise. In the media, it is not uncommon to read or hear about the way humans are threatening butterflies and moths. It is true that Lepidoptera are being threatened across the globe, because of humans. Interestingly, collectors are often mentioned as one of the causes. However, this is very pseudoscientific and generally a very populistic way to shift the blame, and distract the public from the real threat. Collecting individuals does not make any significant impact on Lepidoptera populations. The reason for this is simple, but is generally only understood by entomologists that have studied population ecology. The truth is that individuals are very dispensable if you are talking about any insect species. Insects have such high mortality rates in the wild, that in some cases, only 2% of each individual caterpillars or less make it to adult butterflies or moths – depending on the species of course. This is the reason that many of them produce a great amount of offspring and lay hundreds of eggs: the majority will succumb to birds, viruses, bacteria, fungi, parasitic flies and wasps, freeze to death in winter or starve due to food competition, spiders, you name it. Even the rarest endemic species that live in low densities and have a very limited range – species that come to mind are butterflies like Papilio hospition, Parnassius species, Ornithoptera or perhaps moths like Acanthobrahmaea – have breeding populations that are probably in between 10.000 and 100.000 individuals. In fact, insect population ecology dictates that for a breeding population to maintain itself, even the smallest populations probably consists of over thousands of individuals or more. One cannot catch enough specimens of one species to threaten an entire species. In fact, if you have ever driven your car to the supermarket, you have killed more insects than the average collector does when he goes out to hunt. It is interesting to think that collecting insects in order to preserve them is problematic, while the millions of individuals we crush in our daily lives by simply driving cars, mowing or lawns or construction new roads are mainly disregarded – it is somewhat hypocritical in fact. There is no scientific evidence that collection has ever hurt a or threatened an insect species; despite that, these kind of stories are easy to find on the internet or in the media. 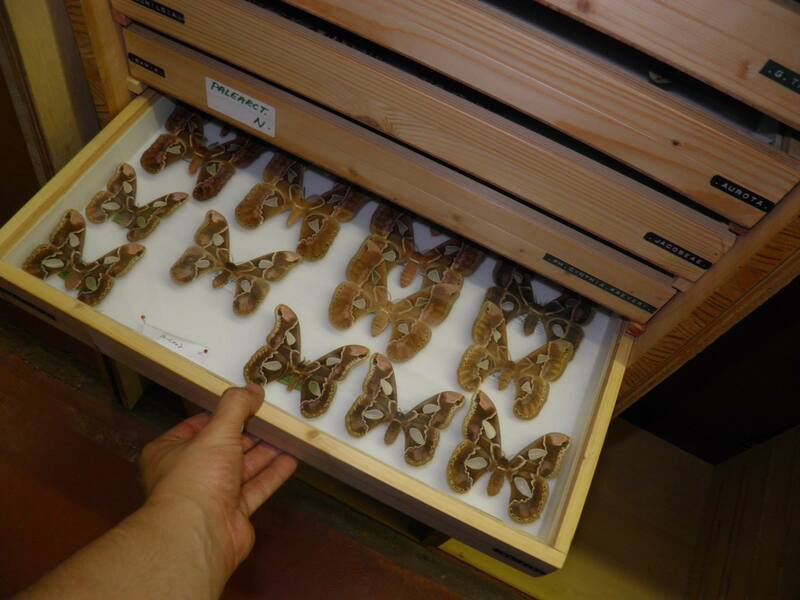 Fun fact: the decline of Lepidoptera populations has in many cases been revealed by studying collection material! Those who argue that collections may contribute to the decline of certain butterflies and moths are not fully aware of the fact that said decline was determined by collections in the first place. Examples include species that were historically collected in geographical locations where they are not found during the present, or the frequency of certain species between collection material. In fact, in many cases it have been the collectors that have alerted ecologists and have made them aware of the decline of certain species. The real threat to butterflies and moths are modern agriculture, deforestation, mismanagement of habitats, insufficient protection measures, urbanisation, pesticides, pollution, climate change and more. But I guess it is easier to blame scientists, biologists and hobbyists for their decline, while all of us are a part of the problem. The main threat is undeniably the decline in habitat. You see, the amount of individuals of a single species that are alive at any given point in time, and the range they cover, is decided by their habitat. The amount of individuals that survive, are exactly the amount of individuals that are supported by the environment. Releasing more individuals does not change the amount of individuals the environment can support. Even if we look at the rarest species in the world, their populations still consist, in many cases of over hundreds or thousands, but in most cases millions of individuals. However, these individuals are often very restricted to specific types of habitats. As you know, most butterflies and moths are specialists that only feed on certain types of plants within certain habitats. This means they aren’t free to survive and reproduce wherever they want to. They are dependent on the plants they feed on and the environment that caters to their specific needs, as they have been adapted to survive in this specific environment. The same habitat that provides for all of their needs, presents them with numerous challenges. From predation to a limited number of food plants (competition!) to variations in local climate to outbreaks of diseases and parasites, the suitability of their enviroment fluctuates a lot, and drives numbers up or down. In a stable, established population, the amount of individuals within a certain habitat are exactly the amount of individuals that the environment can support. You see, if the number of individuals goes up, then problems will arise: due to the high number of individuals of the same species, competition will increase, and so will the infection rate of parasites, diseases and viruses. Many pathogens thrive in an environment where there is a high density of individuals that can infect eachother: food will become scarce as the high number of individuals will have to compete for it, and the numbers will go down as a result. If the number of individuals goes down, the opposite happens: food becomes more freely available, pathogens are less chance to spread, and there will be no competition: the number will go up. Populations fluctuate naturally: they inflate and then collapse, but will to some degree always stabilise around the number of individuals the environment can support. It is evident that populations of butterflies and moths are pretty self-regulating. To sum it up, the amount of individuals that survive, are the amount of individuals that can be supported by the local environment. Boosting their numbers does not help them, for if the number of individuals of a species are increased, so will the pressure they exert on the environment. In return, their numbers or reproduction and survival rates will decrease. Even if you would release millions upon millions of them, the amount of individuals that survive would probably revert back to the original amount in a very short time. Instead, their habitat should be improved. This can be done, for example, with managing the habitat to provide adequate food plants, nectar plants and more. Habitat destruction is the biggest threat to Lepidoptera for they are entirely dependent on their specific habitats. An increase in the surface area of suitable habitat means a greater amount of individuals can be supported by the environment and will increase their numbers in a sustainable way. Mass breeding and releasing can only do harm, as this will artificially increase the pressure on the natural populations, forcing them to compete with individuals that may not be supported by the environment. That being said, breeding projects can save species from extinction, as long as they are combined with efforts to manage the habitats correctly. Collecting Lepidoptera is a science, not just a hobby (unlike breeding or photography). Of course there are people that just collect pretty stuff for the sake of it, that can be called hobbyists but collections form the foundations of our modern knowledge of Lepidoptera, and without them, we would be pretty much nowhere! So are there really no harmful ways of collecting? While this page is to convince you that collection is something to support, one compromise can be made on this page. Although collecting Lepidoptera rarely (if ever) impacts their populations, some harmful methods of collection exist. The traditional and sustainable way to collect insects has been to catch them with (light) traps, by hand/individually or by rearing and breeding. Sadly however, some collectors have taken it to the extreme and developed a method called “fogging”. “Fogging is a technique used for killing insects that involves using a fine pesticide spray (aerosol) which is directed by a blower. … Fast acting pesticides like pyrethroids are typically used. This is widely used for sampling or studying insects in the canopy of tall of forests which cannot be effectively reached.” – it mainly includes covering large areas with insecticide or toxic gas, which kills all the insects in the area so they can be collected. While fogging is also a reliable method used by scientists to collect species that are otherwise difficult to collect, it can be used in an irresponsible way, and may harm habitats in the long term. Fogging should not be used lightly, and only with adequate reason. Some private collectors however have also adopted this method which may be a reason for concern – especially since it usually kills many of the invertebrates found in the area, not only the target species to be collected. Another exception could be species with extraordinarily long development times that are found in low densities (usually not Lepidoptera) such as some types of beetles or in a very limited, isolated area – to mind come some species of Parnassius or Ornithoptera, or species endemic to certain caves or small islands. However, even those species can and should be collected, if not regulated and in appropriate amounts, for the sake of monitoring their populations, morphology, taxonomy and more – and despite the fact that such species have been heavily collected in the past, no evidence exists that this has ever contributed to the decline or extinction of a butterfly or moth. Thank you for reading! Note: in all cases, collectors should respect the law. While it seems that most modern insect protection laws seem to be inadequate or misguided, nothing good can come from smuggling or illegal collection – be it from negative media attention that also impacts serious scientists and collectors to even more unnecessary legislation or government regulations to feeding a black market of poachers that will poach more types of endangered animals with your money (not just insects). Do not attempt to sell, smuggle or capture protected species – no matter your personal views. It can only bring harm to you as an individual and to entomology as a whole. My YouTube channel (videos, guides!) I upload videos of my butterflies and moths nearly every week, sometimes every day. Subscribe to my channel for daily insect videos, blogs and guides!